To Cite: Ghanbari-Niaki A , Saeidi A, Tartibian B, Qujeq D , Naghizadeh Qomi M . The Response of Brain Kisspeptin and Glycogen at Different Times to Acute Aerobic Exercise with and Without Glucose Solution Consumption in Male Rats, J Clin Res Paramed Sci. 2018 ; 7(2):e85193. doi: 10.5812/jcrps.85193. Background: Kisspeptin refers to peptides involved in appetite regulation and responds to energy-decaying agents. The aim of the current study was to survey brain response of kisspeptin and glycogen at different times to acute aerobic exercise with and without glucose solution consumption in male rats. Methods: Eighty adult male Wistar rats, after 2 weeks of familiarization with the laboratory space and treadmill, performed aerobic exercise training for 4 weeks followed by rest for 1 week. Then, based on the weight, they were divided into eight groups: 1, pre-exercise (PE, n = 10); 2, immediately after exercise (IAE, n = 10); 3, 24 hours after exercise-saline (24HAES, n = 10); 4, 24 hours after exercise-glucose (24HAEG, n = 10); 5, 48 hours after exercise-saline (48HAES, n = 10); 6, 48 hours after exercise-glucose (48HAEG, n = 10); 7, 72 hours after exercise-saline (72HAES, n = 10); 8, 72 hours after exercise-glucose (72HAEG, n = 10). Each exercise session of the rats included running on the treadmill for 90 minutes with a speed of 25 m/min with the slope of zero degrees. Glucose and saline solutions were given to the glucose and saline groups immediately after training. The rats were sacrificed after 3 hours of fasting, and the brain tissue was separated for analysis. Results: No significant difference in brain kisspeptin was seen with time, between groups, and for interaction between time and group (P > 0.05). Tissue glycogen analyses showed significant changes between the groups (P < 0.001). Conclusions: The results of this study showed that brain kisspeptin did not respond to stress and disruption of energy balance and did not relate to the reduction of tissue glycogen in the brain. Copyright © 2018, Journal of Clinical Research in Paramedical Sciences. This is an open-access article distributed under the terms of the Creative Commons Attribution-NonCommercial 4.0 International License (http://creativecommons.org/licenses/by-nc/4.0/) which permits copy and redistribute the material just in noncommercial usages, provided the original work is properly cited. Research studies in the field of peptides involved in the balance and adjustment of energy demonstrate that destructive changes in intracellular energy are controlled centrally and environmentally (1). A deeper view of the effective compensatory mechanisms occurring in response to the withdrawal of cellular energy balance in various conditions reveals changes in the peptides which affect appetite, such as NPY, AgRP, orexin, galanin, GABA, nisfatin, visfatin, obestatin, ghrelin, and leptin, and play primary roles centrally and environmentally (2-5). Recently, a peptide called kisspeptin has been identified, which despite its relationship to reproduction, responds to nutritional changes, for instance, fasting, puberty, pregnancy, menopause, stress, and physical activity. Studies on fasting rats suggested that hypothalamic kisspeptin plays a major role in inhibiting the effects of nutritional status and acts as an energy sensor (6, 7). Fasting reduces the expression of KISS-1 mRNA, which is associated with a reduction in circulating leptin (8, 9). Hoffman et al. revealed that there is an inverse relationship between exercise and kisspeptin in people with anorexia nervosa. They demonstrated that walking 2469 - 26047 steps per day for six days has an inverse and direct relationship with kisspeptin and ghrelin, respectively. In this study, after six days, the subjects were divided into two groups: Moderate physical activity (6676 ± 1802 steps/day) and high physical activity (13839 ± 4406 steps/day) groups. The high physical activity group showed 23% reduction in kisspeptin compared with the moderate intensity group. In this study, it was indicated that there is an inverse relationship between ghrelin and kisspeptin (10). Kisspeptin and its receptor in the brain are primarily expressed in the hypothalamus and pituitary gland (11). The expression of kisspeptin decreases in the presence of leptin deficiency (12). The injection of leptin reduces appetite and increases the expression of kisspeptin (13). It has been reported that kisspeptin neuropeptide mRNA levels drop following severe nutritional restriction in rats (6). Since physical activity is known to disrupt energy balance, there is a fall in the energy reserves of the body, such as glycogen, in various tissues including the brain which is one of the main tissues that secretes kisspeptin. A question that arises is, does kisspeptin respond to a disturbance of brain energy balance after an acute endurance activity? Therefore, the aim of the current study was to survey brain response of kisspeptin and glycogen at different times to acute aerobic exercise with and without glucose solution consumption in male rats. All the animal experiments were set up in accordance with Iranian conventions policies. It was also approved by the Ethics Committee at University of Mazandarsn. Meanwhile, eighty Wistar male rats (6 - 8 weeks old, 140 ± 10 g weight) were bought from Pasteur Institute of Iran and placed in the Central Animal House in Faculty of Physical Education and Sports Science of UMZ. The subjects were divided 5 in each cage (46 L) at normal dark light cycle. The temperature and humidity were maintained at 22°C ± 1.4°C and 50% ± 5%, respectively. Diet (in pellet form) and water were provided ad libitum. The animals were in the specific age and weight range, and any inability to adhere to the exercise protocol was considered as an exclusion criterion. After 2 weeks of familiarization to the laboratory space and treadmill, the rats performed aerobic exercise training for 4 weeks. The first week of the program consisted of running at speeds of 15 m/min for 30 minutes, the second week running at 20 m/min for 60 minutes, the third week running at 25 m/min for 75 minutes, and the fourth week running at the speed of 25 - 30 m/min for 90 minutes on a treadmill with a gradient of zero degrees. The rats were rested for a week after completing the training period. After that, 10 rats were assigned to the pre-exercise (PE) and 10 rats to the immediately after exercise (IAE) groups. The other 60 rats were divided into two groups with 30 rats in each. 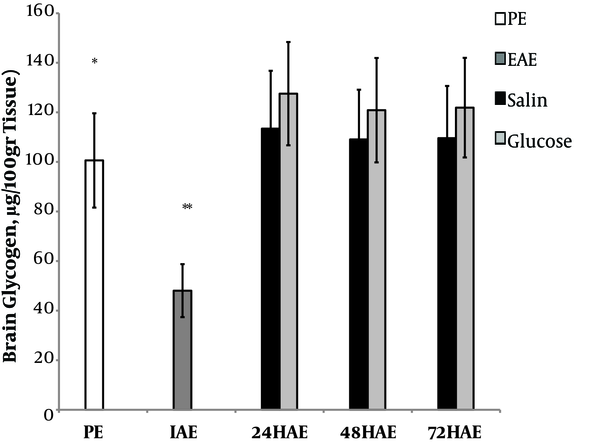 Group saline was further divided into three groups: 1, 24 hours after exercise (24HAES, n = 10); 2, 48 hours after exercise (48HAES, n = 10); 3, 72 hours after exercise (72HAES, n = 10). Group glucose was also divided into three groups: 1, 24 hours after exercise (24HAEG, n = 10); 2, 48 hours after exercise (48HAEG, n = 10); 3, 72 hours after exercise (72HAEG, n = 10). Each training session of the rats included running on the treadmill for 90 minutes with a speed of 25 m/min and slope of zero degrees (14). Immediately after the exercise, the supplemented groups of rats were given oral glucose solution. D-glucose, purchased from Merck Co., was dissolved in distilled water. The dosage used was 6 mg/g of body weight as 33% solution (15). The saline groups were hydrated immediately after training. The rats were anesthetized by intraperitoneal injection of ketamine and xylazine while they were fasting for three hours (water was available). The brain tissue was separated and transferred to microtubes that were kept in liquid nitrogen and then stored at −80°C for later assessment. All the experimental procedures including laboratory measurements and training and sacrificing the animals were performed in the morning time between 8 − 11 a.m. in the University of Mazandaran. The tissues were transported to a Chinese oven and homogenized with powder. Kisspeptin was quantified in the brain samples by ELISA. Kisspeptin 1 levels were measured by Eastbiopharm rat kisspeptin ELISA kit (cat number: CK-E90458) according to the manufacturer’s instructions. A tiny slice of the brain tissue was collected to measure glycogen. Brain glycogen was measured by the indirect anthrone reagent method (16). The normal distribution of the data was determined using the Kolmogorov-Smirnov test and Levene test for homogeneity of variance. Next, independent t-test was used for determining the intergroup difference between the two groups, before and immediately after the training. Two-way ANOVA test was used to compare the saline and glucose groups at different times and the interactions between them. One-way ANOVA test was used to detect any difference between the saline and glucose groups separately. The LSD test was also used. The significance level of the tests was considered as alpha = 0.05. Kolmogorov-Smirnov test and Levene test showed that all the data were normally distributed and had homogeneous variance (P > 0.05). Independent t-test showed a significant difference in the brain glycogen between the two groups before and immediately after training (P < 0.001). Two-way ANOVA test for comparison of the saline and glucose groups at different times and interactions between them for brain glycogen showed that there was no significant difference with time (P = 0.507) and no interaction between group and time (P = 0.957), but there was a significant difference between the groups (P < 0.001). 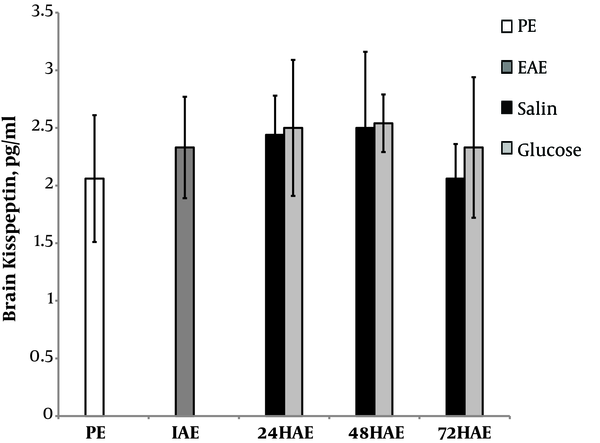 Also, one-way ANOVA test between the saline groups with the group before and immediately after training showed a significant difference (P < 0.001). Tukey's post hoc test showed that the saline groups immediately after training, after 24, 48, and 72 hours, had a significant difference (P < 0.001). One-way ANOVA test between the glucose groups with the group before and immediately after training showed a significant difference (P < 0.001). Tukey's post hoc test showed that there was a significant difference (P < 0.001) between the glucose group immediately after training, after 24, 48, and 72 hours. Also, there was a significant difference between the pre-exercise group and the group 24 hours after training (P = 0.048) (Figure 1). Independent t-test showed a significant difference in brain kisspeptin between the two groups before and immediately after training (P = 0.793). Two-way ANOVA test comparing the saline and glucose groups at different times and their interactions for brain kisspeptin showed that there was a significant difference between the groups (P = 0.584) and the different times (P = 0.091). There was no significant difference for the interaction of group and time (P = 0.845). One-way ANOVA test showed that there was no significant difference between the saline groups and the group immediately before and immediately after training (P = 0.383). One-way ANOVA test between the glucose groups and the group before and immediately after training did not show a significant difference (P = 0.367) (Figure 2). The present study showed that kisspeptin in the brain tissue did not respond to physical training, and change of energy balance did not significantly affect kisspeptin in the brain. Atkinson introduced the theory of energy charging in 1997. Based on this theory, the absolute amount of ATP in the cell depends on the adenylate stores of the cell. So the charging cell maintains its energy under different conditions. The energy charge in the brain is 0.85 - 0.95. Therefore, it is observed that brain has a higher energy charge than other tissues. The energy charge declares that there is little change in the daily rhythm in ATP cells, and the energy charging of cells during physical activity, fasting, and so on remains relatively constant. Although the turnover of ATP is very high during exercise, the body quickly replaces the ATP stores and does not allow a lot of changes and drops (17). One of the possible reasons for the absence of a significant alteration in the amount of kisspeptin following the long-term training is that the kisspeptin synthesizing neurons are located in two main regions of the hypothalamus, the periosteum region and the arc nuclei (18). This study of kisspeptin changes induced by energy imbalance due to exercise was measured in the entire brain instead of the hypothalamus itself. Other reasons may be the intensity and duration of the exercise training. The present study showed that endurance training significantly reduced glycogen after activity. It also showed that in the groups that consumed glucose, glycogen recovery was higher than that in the groups that consumed saline. After depletion by exercise, muscle glycogen synthesis occurs in a two-phase manner. In the first step, there is a fast, independent of insulin glycogen synthesis, which is between 12 and 30 μM/g water per hour, lasting for 30 to 40 minutes (19). This step, however, is only being activated after muscle glycogen stores are gone considerably, and in the glucose availability condition. In the second stage, which is dependent on insulin, the amount of glycogen synthesis is reduced by 2 to 3 micromoles per gram of water weight per hour in normal conditions (19). However, carbohydrate supplementation can increase the amount of synthesis as a concept, in a slow phase (20), and if the supplement is maintained periodically, it can ultimately lead to a higher natural glycogen or more compensated glycogen (21, 22). Calculation of glycogen synthesis fast phase after exercise assumed as an active mode of glycogen synthase, which is strongly influenced by the muscular glycogen concentration (22, 23). Muscular glycogen concentration is reduced after exercise activated glycogen synthase more than usual. On the other hand, with glycogen concentration increment, the activity of glycogen synthase could be decreased. As it described before, the reverse association between muscle glycogen and glycogen synthesis activity is due to the both glycogen synthase and glycogen protein phosphatase synthesis to glycogen as part of a glycogen protein. If glycogen concentration reduced, both of them are released, therefore active phosphatase could catalyze glycogen synthase phosphorylation (22, 23). An exercise-induced increase in the glycogen synthase activity catalyzes the fast renewal of glycogen only if sufficient substrate is available. Hence, an essential cellular modification that enables fast increase in muscle glycogen after exercise is an increase in the permeability of the cell to glucose (22). In this regard, muscle contraction has an effective and prolonged effect like insulin on muscle permeability to glucose (24, 25). This is simply because of a prolonged proliferation of glucose transducers in the plasma membrane (22). Increasing the concentrations of glucose transporters is due to muscle contraction activity, however, it takes over 30 - 60 minutes , this is because glucose concentration from plasma membrane decreases ultimately in the absence of carbohydrate supplements (22, 25, 26). Therefore, increasing the permeability of membrane to glucose, all together with glycogen synthase activation, provides a rapid initial synthesis of insulin-independent muscle glycogen after exercise, which significantly reduces muscle glycogen stores (22, 25, 26). The second step is glycogen synthesis with a significant increase in muscle sensitivity to insulin. This could increase sensitivity resulting in muscle glucose uptake and more glycogen synthesis accompanied with insulin concentration, which usually has no obvious effect on both processes (22, 25, 26). In addition, this process can be maintained for several days by taking appropriate carbohydrates and so having extra glycogen compensation (22, 25, 26). The reasons for supercompensation of glycogen include the increase of insulin, the use of glucose solution, and increased activity of glycogen synthase enzymes. The results of this study showed that brain kisspeptin did not respond to stress and disruption of energy balance in the brain and did not relate to the reduction of tissue glycogen in the brain. We would like to thank Dr. Azarmeidokht Ghahari, the chief of Babolsar Pathobiology Lab for analysis. Authors' Contribution: Abbass Ghanbari-Niaki, Ayoub Saeidi, Bakhtyar Tartibian, Durdi Qujeq and conceived of the study, and participated in its design and coordination and helped to draft the manuscript. Ayoub Saeidi, Abbass Ghanbari-Niaki, Mehran Naghizadeh Qomi participated in data collection and statistical analysis; and Ayoub Saeidi, Mehran Naghizadeh Qomi, Bakhtyar Tartibian performed the statistical analysis and drafted the manuscript. All authors have read and approved the final version of the manuscript, and agree with the order of presentation of the authors. Ethical Considerations: This research was conducted under the supervision of the Ethics Committee of the University of Mazandaran. Financial Disclosure: None of the authors declare competing financial interests. Funding/Support: Exercise Biochemistry Division, Faculty of Physical Education and Sport Science, University of Mazandaran, Babolsar, Iran. 1. Konturek PC, Brzozowski T, Pajdo R, Nikiforuk A, Kwiecien S, Harsch I, et al. Ghrelin-a new gastroprotective factor in gastric mucosa. J Physiol Pharmacol. 2004;55(2):325-36. [PubMed: 15213356]. 2. Inui A. Transgenic approach to the study of body weight regulation. Pharmacol Rev. 2000;52(1):35-61. [PubMed: 10699154]. 3. Qian S, Chen H, Weingarth D, Trumbauer ME, Novi DE, Guan X, et al. Neither agouti-related protein nor neuropeptide Y is critically required for the regulation of energy homeostasis in mice. Mol Cell Biol. 2002;22(14):5027-35. doi: 10.1128/MCB.22.14.5027-5035.2002. [PubMed: 12077332]. [PubMed Central: PMC139785]. 4. Zhang Q, Tordoff MG. No effect of dietary calcium on body weight of lean and obese mice and rats. Am J Physiol Regul Integr Comp Physiol. 2004;286(4):R669-77. doi: 10.1152/ajpregu.00655.2003. [PubMed: 14684563]. 5. Shimizu H, Ohsaki A, Oh IS, Okada S, Mori M. A new anorexigenic protein, nesfatin-1. Peptides. 2009;30(5):995-8. doi: 10.1016/j.peptides.2009.01.002. [PubMed: 19452636]. 6. Castellano JM, Navarro VM, Fernandez-Fernandez R, Nogueiras R, Tovar S, Roa J, et al. Changes in hypothalamic KiSS-1 system and restoration of pubertal activation of the reproductive axis by kisspeptin in undernutrition. Endocrinology. 2005;146(9):3917-25. doi: 10.1210/en.2005-0337. [PubMed: 15932928]. 7. Smith JT, Acohido BV, Clifton DK, Steiner RA. KiSS-1 neurones are direct targets for leptin in the ob/ob mouse. J Neuroendocrinol. 2006;18(4):298-303. doi: 10.1111/j.1365-2826.2006.01417.x. [PubMed: 16503925]. 8. Bowe JE, King AJ, Kinsey-Jones JS, Foot VL, Li XF, O'Byrne KT, et al. Kisspeptin stimulation of insulin secretion: Mechanisms of action in mouse islets and rats. Diabetologia. 2009;52(5):855-62. doi: 10.1007/s00125-009-1283-1. [PubMed: 19221709]. 9. Hauge-Evans AC, Richardson CC, Milne HM, Christie MR, Persaud SJ, Jones PM. A role for kisspeptin in islet function. Diabetologia. 2006;49(9):2131-5. doi: 10.1007/s00125-006-0343-z. [PubMed: 16826407]. 10. Hofmann T, Elbelt U, Haas V, Ahnis A, Klapp BF, Rose M, et al. Plasma kisspeptin and ghrelin levels are independently correlated with physical activity in patients with anorexia nervosa. Appetite. 2017;108:141-50. doi: 10.1016/j.appet.2016.09.032. [PubMed: 27693487]. 11. Martino NA, Rizzo A, Pizzi F, Dell'Aquila ME, Sciorsci RL. Effects of kisspeptin-10 on in vitro proliferation and kisspeptin receptor expression in primary epithelial cell cultures isolated from bovine placental cotyledons of fetuses at the first trimester of pregnancy. Theriogenology. 2015;83(6):978-987 e1. doi: 10.1016/j.theriogenology.2014.11.033. [PubMed: 25549944]. 12. Quennell JH, Howell CS, Roa J, Augustine RA, Grattan DR, Anderson GM. Leptin deficiency and diet-induced obesity reduce hypothalamic kisspeptin expression in mice. Endocrinology. 2011;152(4):1541-50. doi: 10.1210/en.2010-1100. [PubMed: 21325051]. [PubMed Central: PMC3206710]. 13. Altarejos JY, Goebel N, Conkright MD, Inoue H, Xie J, Arias CM, et al. The Creb1 coactivator Crtc1 is required for energy balance and fertility. Nat Med. 2008;14(10):1112-7. doi: 10.1038/nm.1866. [PubMed: 18758446]. [PubMed Central: PMC2667698]. 14. Ghanbari-Niaki A, Khabazian BM, Hossaini-Kakhak SA, Rahbarizadeh F, Hedayati M. Treadmill exercise enhances ABCA1 expression in rat liver. Biochem Biophys Res Commun. 2007;361(4):841-6. doi: 10.1016/j.bbrc.2007.07.100. [PubMed: 17689492]. 15. Shulman GI, Rothman DL, Smith D, Johnson CM, Blair JB, Shulman RG, et al. Mechanism of liver glycogen repletion in vivo by nuclear magnetic resonance spectroscopy. J Clin Invest. 1985;76(3):1229-36. doi: 10.1172/JCI112078. [PubMed: 4044833]. [PubMed Central: PMC424028]. 16. Seifter S, Dayton S; et al. The estimation of glycogen with the anthrone reagent. Arch Biochem. 1950;25(1):191-200. [PubMed: 15401229]. 17. Atkinson DE. The energy charge of the adenylate pool as a regulatory parameter. Interaction with feedback modifiers. Biochemistry. 1968;7(11):4030-4. doi: 10.1021/bi00851a033. [PubMed: 4972613]. 18. Smith JT, Li Q, Pereira A, Clarke IJ. Kisspeptin neurons in the ovine arcuate nucleus and preoptic area are involved in the preovulatory luteinizing hormone surge. Endocrinology. 2009;150(12):5530-8. doi: 10.1210/en.2009-0712. [PubMed: 19819940]. 19. Price TB, Rothman DL, Taylor R, Avison MJ, Shulman GI, Shulman RG. Human muscle glycogen resynthesis after exercise: Insulin-dependent and -independent phases. J Appl Physiol (1985). 1994;76(1):104-11. doi: 10.1152/jappl.1994.76.1.104. [PubMed: 7909795]. 20. Ivy JL, Katz AL, Cutler CL, Sherman WM, Coyle EF. Muscle glycogen synthesis after exercise: Effect of time of carbohydrate ingestion. J Appl Physiol (1985). 1988;64(4):1480-5. doi: 10.1152/jappl.1988.64.4.1480. [PubMed: 3132449]. 21. Hultman E. Studies on muscle metabolism of glycogen and active phosphate in man with special reference to exercise and diet. Scand J Clin Lab Invest Suppl. 1967;94:1-63. [PubMed: 6059926]. 22. Ivy JL. The regulation and synthesis of muscle glycogen by means of nutrient intervention. Encyclopaed Sport Med IOC Med Comm Pub. 2013;19:113-25. doi: 10.1002/9781118692318.ch8. 23. Bloch G, Chase JR, Meyer DB, Avison MJ, Shulman GI, Shulman RG. In vivo regulation of rat muscle glycogen resynthesis after intense exercise. Am J Physiol. 1994;266(1 Pt 1):E85-91. doi: 10.1152/ajpendo.1994.266.1.E85. [PubMed: 8304447]. 24. Ivy JL, Holloszy JO. Persistent increase in glucose uptake by rat skeletal muscle following exercise. Am J Physiol. 1981;241(5):C200-3. doi: 10.1152/ajpcell.1981.241.5.C200. [PubMed: 7030083]. 25. Richter EA, Garetto LP, Goodman MN, Ruderman NB. Enhanced muscle glucose metabolism after exercise: Modulation by local factors. Am J Physiol. 1984;246(6 Pt 1):E476-82. doi: 10.1152/ajpendo.1984.246.6.E476. [PubMed: 6430094]. 26. Cartee GD, Young DA, Sleeper MD, Zierath J, Wallberg-Henriksson H, Holloszy JO. Prolonged increase in insulin-stimulated glucose transport in muscle after exercise. Am J Physiol. 1989;256(4 Pt 1):E494-9. doi: 10.1152/ajpendo.1989.256.4.E494. [PubMed: 2650561].